Our favourite social failure is back – and she’s wearing a crown. That’s our kind of fashion accessory! But she’s meant to be Queen of Dorks, right? So how has Nikki ended up as queen of a fairytale kingdom? For some reason, Nikki and her crowd are playing rather familiar fairy tale roles. Nikki’s the queen, of course, but we reckon mean girl Mackenzie fits right into the role of a wicked stepsister. Plus – roll up, Brandon! A handsome prince will certainly be called for. But what’s going on? Has Nikki had a knock on the head? And will this fairy tale have a happy ending? Errr… that would be telling. I love this book, because I am very familiar with the farytales as well. Love reading this amazing book!!! My favourite book from the seriese!! I love the way it is a bit like the tale the wizard of ozz!! 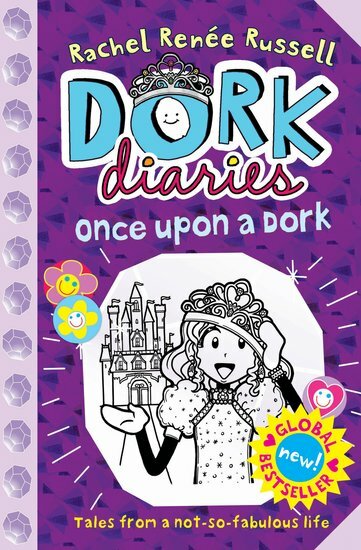 this book is very interesting because it has been written like it was from somebodies actual diary which is why I like it so much I think it should be rated for 9-10 year old [GIRLS] I don’t think that the boys should like diaries because they don’t like them but girls oh yeah they love diaries. I think this is the best book in the series because finally Mackenzie gets a taste of her own medicine.